A VAMPIRE IN THE ITALIAN AGE OF GOLD. . . Sixteen years old, Vittorio is the sole survivor of a bizarre and violent massacre at his father's Tuscan palazzo. Escaping to the Florence of Cosimo de Medici, he seeks vengeance and retribution. But though he has been saved from death by a mysterious woman, he finds himself at the mercy of demonic, bloody nightmares, war and political intrique. And, beyond even these perils, Vittorio faces being torn apart by a dangerous love. 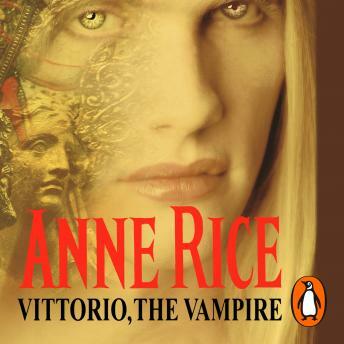 Against a backdrop of the wonders - both sacred and profane - of Rennaisance Italy, with it's art and ferocity, angels and demons, Anne Rice introduces a seductive new character and creates a passionate traggic legend of doomed young love and lost innocence.